Hi guys! Iâ€™m Little Money! Or â€œNot So Little Moneyâ€� as my friends at The Turtle Hospital called me. Itâ€™s probably because I weigh a whopping 365 pounds! Although Iâ€™m an adult female turtle like most of my competitors, I was not nesting when I was found. I was actually found by a boater beached on Money Key back in June. It took two Turtle Hospital staff and three FWC officers on two boats to rescue me. 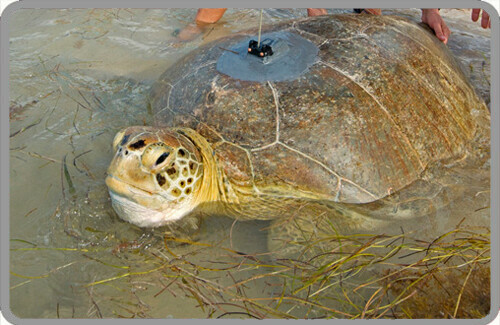 I was treated at the Turtle Hospital for gastrointestinal issues and received broad spectrum antibiotics, vitamins, fluids and a healthy diet. Now that Iâ€™m healthy and swimming strong, Iâ€™m ready to return to my ocean home! Iâ€™m swimming to help raise awareness about boat strikes and safe boating practices. A lot of my flippered friends back at the hospital were actually boat strike victims, so itâ€™s a cause close to my heart. My buddy Coco and I are the only rehabilitated turtles participating in the race, which is pretty neat! And who knows, since Iâ€™m a mature female, maybe Iâ€™ll come back to shore to nest this season? Only time will tell! I was named by my Sponsor, Sea Life Trust. Check out my marathon migration map, where you can follow along as I swim to raise awarness about the threat of Boat Strikes to sea turtles. Please help me raise awareness about my cause by supporting me!